I always find it interesting reading about this game. It seems like half the people can’t catch jack and the other half can’t escape the cops. I wonder why this split exists. In our games the police were usually able to find Jack. In 12+ games he has only won twice. Although he came close numerous times (2-3 times simple mistakes kept him from winning) Part of this is how the police are able to deduce Jack’s location, despite various strategies on JR’s part, by working together. As a rule the police aren’t able to communicate with each other except between rounds and if they are within 3 spaces of each other. It adds a new element of communication to the cops and given the lack of communication at the time, makes sense thematically. It also cuts down on the alpha player, and the seemingly endless discussion. But if your Jack keeps winning, ignore! In case you find a chance/time to do some back-and-forth to throw off constables, it might come extremely handy to conceal your hideout or to buy chance to escape by using misinformation. When you come to a junction, just go once or twice to wrong direction (one or two different direction) before heading towards your hideout, simple trick that get constables confused. If you time it perfectly you hit your hideout before they figure out which is the right direction. Second trick is when you have decent distance to constables and one of them finds your track, use alley crossing to skip through a block as seemingly in panic to escape the situation. This almost certainly get constables in bloodhound mode. They start conversing on location where you’re not even near of and all inconvenient road blocks are gone, also same applies to snoopy constables around your hideout. We rarely start the game using any of the in-rule variants, instead, introducing them after the second night depending on whether the game is leaning toward Jack or the Police. For example, after two nights of Police finding very few or scattered clues, it can feel like the third night is simply “starting again”, so we would introduce Area Arrests, or Rushing, to help the Police. Similarly, if the Police have found out too much, too soon, Jack can then introduce the Letters or False Clues. This is generally a unanimous decision in our group, as we like to see a more balanced game, though I can see how it may not work for some, who might consider it “cheating”. If you are playing against Jack the Ripper as the detectives, remember that you don’t have to arrest him to defeat him. Jack needs to return to his hideout every night. Instead of investing their time in hunting Jack down himself, the detectives can try to cordon off the hideout. Jack cannot enter his hideout through using special movement like the coach or alley, and Jack cannot move through detectives normally without the coach. With these handicaps, if you have a good idea of where the hideout is, you can surround it and provide an effective roadblock. If you can stall Jack long enough to prevent him from entering his hideout, the game is yours. When I play as Jack I always do the same thing on the first night (thankfully nobody I’ve played with has caught on yet). I make my first kill relatively close to my hideout… never the closest spot (like @Brady Boothe I save that for the last night), but one that I could get to in 5 or 6 moves if I took a direct route. Then I make a giant circle to get to my house. I head in the opposite direction of my hideout initially, and make most of my lateral movements on the opposite side of the board from my hideout. When I’m down to half of my moves left, I’ll start heading for the hideout – which will always be going in the direction I just came from. If I have the spare moves to afford it, I will stall around my house long enough to give the inspectors a chance to put together my path up to the “pivot point”. This way, they waste night 2 (and sometimes night 3 as well) believing I’m heading to a completely different quadrant of the board. If they manage to correct path on night 3, they will still have much too big of an area that “might” be my hideout to have anything other than a dumb luck chance of catching me. So, if your game group is like mine, you have a many different personalities present. 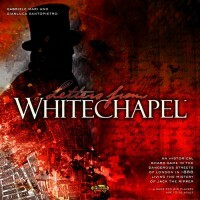 Letters From Whitechapel, and other co-op games, can present a challenge when it hits the table. Specifically, aggressive players tend to control the other players actions when they play on the side of the police. While players should work together, it should ultimately be up to the player to determine where they want to move and search for hints. No one player should dictate this and make others uncomfortable…it ruins the experience for everyone but that player. If the aggressive player suggests the game try to get them to play Jack. The solo mechanic of playing Jack will suit their personal playstyle much better. Another downside to the game is having quiet, reserved players play the role of police. While you should never be overbearing to the point of playing the game for everyone, the opposite is true. You need to communicate your ideas to the rest of the team to be effective. If you see one person not participating, try going out of your way to ask them what they think, where they think Jack is, etc. Elicit the response from them and get them involved. It will make their experience much better. As a whole, even though I really enjoy this game, it is very group specific to whom is present. If I know I have an aggressive player coming over or a lot of deep thinkers I tend to leave this on the shelf and try to find something else to play. When we play Letters from Whitechapel, we send the closest detective to the murder to quickly figure out what direction Jack is moving (follows all routes). If the Jack player is smart, he/she usually leaves a few false trails, and the first cop’s job is to figure out which trail is the “real” trail as quickly as possible. This can also give you some idea how far Jack could be down his “real” trail if you count the moves. This strategy does remove a cop from the “real” chase, but we find the division of labor works out well. usually, more than one player ends up being first cop, so the job doesn’t fall on one person the whole game (which could get boring). Try it out, and see if it works for your team of detectives. Any good serial killer properly plans before beginning his crime spree. When playing Jack, choose your hideout with your final kill in mind. You will have fewer special moves available and the police will likely have a good idea of the general area of your hideout. Pick a location that will be easier to access from the final murder and, ideally, someplace that has enough access points as to be difficult to blockade. I have found that if you are Jack you need to leave the scene of the crime quickly. Use your alley jumps and carriages to move away quickly. Then use the rest of your moves to take the roundabout way back to your hideout. If you take a direct route, by the 2nd or 3rd night the cops will have a general idea of where you are headed. So make that first night a maze through the streets of London. Then on the next nights you can work faster. A kill and direct route home can lead to disaster in the following nights as the police will be on to you. If you hang around the scene too long the police will realize deduce where you are quickly and then the chase is on. Currently, the Police pawns can move up to 2 crossings. After all Police pawns have moved they choose which action to take. Often however a Police pawn is so far out of position due to whatever circumstance that they are effectively useless. Try this alternative: On a Police pawns’ movement they can choose to move 0-3 crossings. If they choose to move the full three (3) crossings they completely forgo any actions for this turn. This adds a layer of choice, strategy, tactics, and overall tension that we’ve found to be even more appealing. If you are the detectives don’t swarm an area unless you know for a fact that Jack is there. Otherwise, he will jump down a back alley and be gone. Be patient. Find out what you can the first two nights. And then make your move on the 3rd or 4th night. Patience is key to victory. For those who would like to play this game but have had trouble getting it played due to the theme. You can easily reinterpret this game by making Jack a Cat burglar who must choose from a number of potential houses to burgle. Replace the damsel tokens with your Monopoly house tokens and you’re set. I saw this “House Rule” on the FAQ page for LFW. It said that instead of the police asking a question about clues or making an arrest. They could “rush-in”, which means they can move another space instead of asking a question. I thought this was a great idea, as most of the police are no where near the crime at the start of the night. After playing a few times, I have noticed that there is definitely a sweet-spot for player count. Most specifically, if the game is played with more than 3 players, someone is always left out or starts falling asleep or makes excessive bathroom breaks. This is mainly because one or more players will be forced to only control one officer pawn and if that pawn is off in no man’s land due to Jack’s choice of crime scene; the game has close to zero entertainment value for many consecutive turns. My advice is to try the game for the first time with 3 players as all 3 players will be actively engaged and Jack will have a good opportunity to hear some table talk and not just “fly blind.” To me, the game plays best with 3, but is also an excellent 2-player deduction game, if a little silent at times. What would be the one thing that Jack wouldn’t do? Move towards the police. This is a bit of a risky move, but the police won’t expect it. I haven’t tried this one out yet, but I think it would work like a charm. I haven’t tried this yet, but we have talked about adding a timer to this game. It seems that the detectives turn and tend to linger and drag a little. This can make a 90-120 minute game go for 3 plus hours. It would be great to maybe set a time limit on turns. This is as easy as grabbing an egg timer or an hour glass from any number of games. I think a 5-10 minute limit is enough time, without lending to AP.